Having scored the winning goal in Ac Milan’s last match against Chievo last weekend, Brazilian starlet, Alexandre Pato looked more determined to push the coaching staff in getting his position in the team’s starting line up back again. The 21-years-old striker’s new determination was seen in the Rossoneri’s training ground on Tuesday, where the player surprisingly showed up for training despite still being given a day off that day. Reports from Milanello stated that the striker spent around one and half an hour with the Milan’s coaching staff in working on his game which hopefully would convince head coach, Massimiliano Allegri to starts him more regularly. 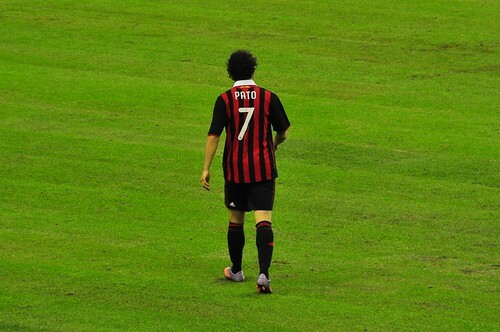 The striker has been mostly used as a second half sub since coming back from his injury earlier this year, the good combination between Antonio Cassano and Robinho with Zlatan Ibrahimovic also minimized Pato’s chance as a starter. Considering Milan will have a tough few matches up ahead, surely having a highly motivated talent such as Pato ready to give his all in competing for a place in the starting line up would give lots of benefit for Allegri’s team. Many pundits speculated that the young Brazilian seems to have a problem in linking up with Ibrahimovic as their combination still isn’t as good as many would predict it would be. Pato’s commitment in the training ground also squashed again some previous rumors saying that the striker might be on his way out of San Siro in the summer after the press speculated that he would be swapped with Real Madrid’s defender, Sergio Ramos. Considering the fact that the striker is determined in proving his worth with the Rossoneri, the Brazilian international doesn’t seemed interested in leaving Milan especially since he hasn’t really win anything with the Italian giant.